Males and females look exactly the same, but females tend to be upwards of 20 percent larger. It is difficult to tell them apart, unless they’re perching next to each other. While adults appear to be black and white, they are actually brown and white. Juveniles are splotchy brown and white for the first 5–7 years of life. Only when they reach full adulthood do they obtain the bold dark body and striking white head and tail. Bald eagle adults weigh 8–12 pounds. They can be aggressive when hunting for food, but, contrary to legend, they cannot carry off your dog or small child. Like other birds, they are governed by aerodynamics. 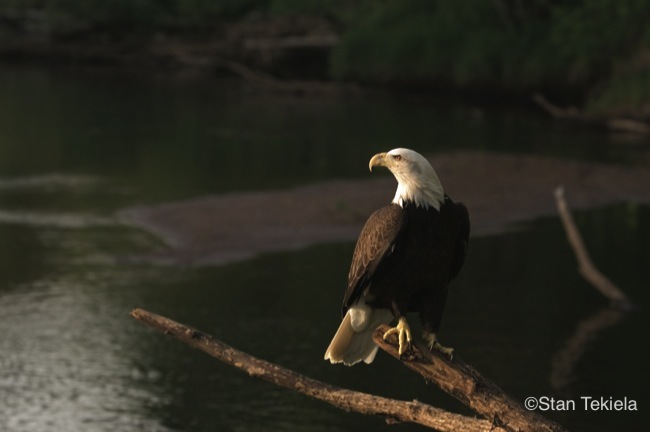 From a dead lift, it is possible for a bald eagle to carry off a fish weighing 3–4 pounds. If it’s flying or swooping at a brisk 20–30 mph and grabbing prey without stopping, it can pick up more weight. A bald eagle may be able to lift something as heavy as itself, but it can’t go very far with it. So your children and pets are safe. 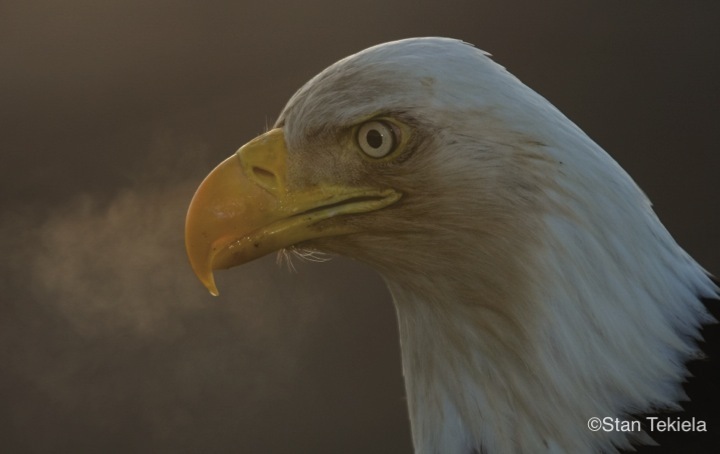 Hunting and the overuse of the pesticide DDT caused the bald eagle to become nearly extinct, with populations hitting an all-time low in the 1960s–1970s. Populations have since rebounded under the protection of several environmental laws. In July 1995, the bald eagle was placed on the endangered species list, but it recovered well enough to be removed in June 2007. 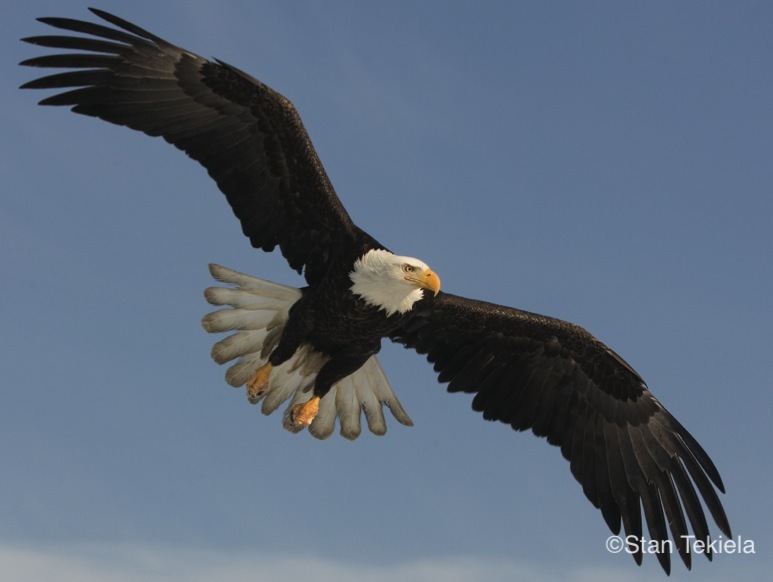 Bald eagles are master builders, constructing the largest nests of any bird in North America. Comprised of small to large sticks, nests are constantly being remodeled and expanded, growing in size over time. 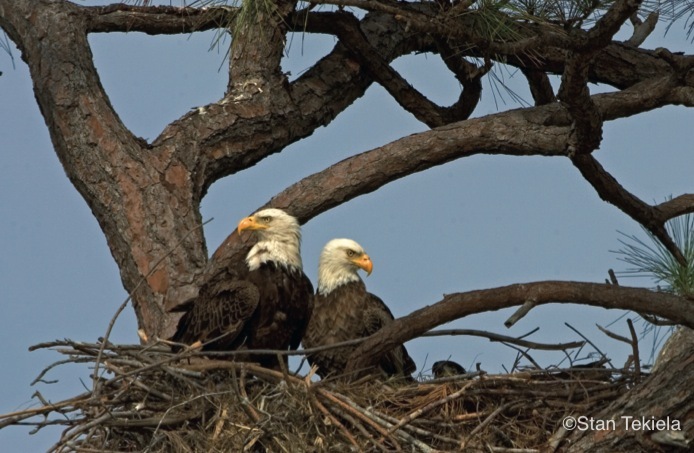 nests need to be large enough to house upwards of four young eaglets. Many record-setting nests were found to be up to 20 feet deep and 10 feet wide, and a nest in Florida was estimated in 1963 to weigh nearly 3 tons! Many of these nests were used for decades, up to around 20–30 years.